S.E. Hinton is best known for her novel, The Outsiders. Seriously, is there a person on the planet who is not familiar with this book? Hinton was still a teenager when the book was published. (I love to tell my students she was just 16 when she wrote it, but I don’t know that for sure.) The Outsiders is pretty much the slam-dunk book to give to a student who claims he doesn’t like to read. Works for girls, too, by the way. But then I love to tell them that if they enjoyed Ponyboy and Johnny and the rest of the greasers, they’ll love That Was Then, This is Now, which is my favourite Hinton novel. Her characters feel authentic to me and I suspect that’s why teens still love them, even though some of the stuff feels dated. Which brings me to Hawkes Harbor. 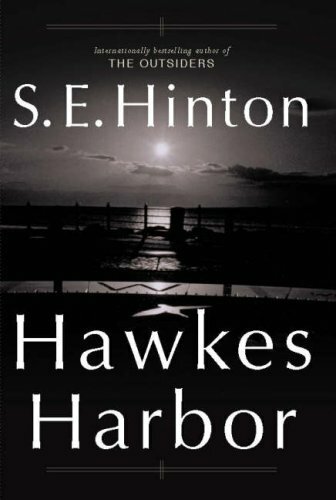 Published in 2004, it was Hinton’s first novel in 15 years. It was also her first adult novel. It’s also really, really strange. And, truthfully, i don’t know if I mean that in a “don’t waste your time” way or in a “I couldn’t stop reading it even though it was really bizarre” way. Jamie Sommers (not to be confused with the bionic woman) is orphaned at a very young age and sent to love with the nuns. It is 1950…and that is all you get to know about that. When we catch up with him he’s a mental patient at Terrace View Asylum. Bad stuff has happened and Dr. McDevitt is trying to help him remember. McDevitt can’t decide if Jamie’s tales of derring-do are authentic or the fantasies of an addled brain. In any case, the reader learns that after a stint in the navy, Jamie hooked up with an Irishman named Kell and the two of them sailed around the world looking to make their fortune – mostly illegally. Eventually they ended up in Hawkes Harbor and that’s where things took a turn for the worse. Um. This is where we meet the vampire. It’s not what I was expecting. At all. And I can’t say that I believed it because it was at this point that Hinton broke her contract with me. Really? A vampire? I just didn’t get it. The writing is decent, albeit choppy, which might have something to do with the nature of the narrative and the fact that the story jumps around. Jamie is compelling enough. This is a decidedly adult novel, so I won’t be recommending it to my students. Sadly, I doubt I’d recommend it to anyone. No matter. I still love you, Ms. Hinton. This entry was posted in Book Chat and tagged 2013, popular fiction by Christie. Bookmark the permalink.